My son is 10 today. As we like to tell him (after hearing the saying from a good friend), he's the one we've loved the longest. He's the one who taught us, through trial and error, how to be parents. He's such a funny, curious, loving child, and it boggles my mind how much of his father (and me, if I'm being honest) I can see in him, yet he's also so much more than either or both of us. On the occasion of his 10th birthday, here are 10 reasons he's an amazing kid. He has a whip-smart sense of humor. I'm not an overly braggy mother (I tend to inwardly roll my eyes at parents who constantly say their kid is the smartest/most beautiful/most talented), but he really is a funny kid. It can definitely veer on the "sophisticated" (sarcastic) side, but he's known for making his teachers, friends (and family, natch) laugh with his one-liners. He loves nature. I never had a fascination with the outdoors as a kid, but this child just loves learning about animals, habitats, meteorology, and astronomy. He and his father make regular trips to visit the natural history museums in DC and NYC, where they geek out together about all of the latest exhibits. He is kind. Kindness, as my friend Patience writes about, is important to cultivate in children. Of my three kids, he's the one most likely to ask me how I'm feeling and whether he can do anything help. Recently, when I was going through a lot of health issues, he came home from school and made me a cup of hot cocoa and a quesadilla. Those foods don't usually go together, but it was a lovely "get well mama" treat. He remembers his Abuela. Because he was 6 1/2 when she died, he's the only one of my kiddos who really remembers Mami. They had a special bond. She lived with us for two years in Brooklyn, and she would pick him up from pre-school every day at 4PM. Afterward they would go to Miss. Ellie's bodega or the long-defunct Peaches Ice Cream shop together for a treat. When he was not quite 5 years old, my son announced to his grandmother: "Abuela, I'm going to be a doctor when I grow up, so I can make you all better." Oh how she loved to tell that story. I do too. He's a good sport. Notice I didn't say he's good AT sports, because that wouldn't really be precise. But he is a good sport during the various team sports we make encourage him to play every year. So far, he doesn't seem destined for any athletic scholarships, but he isn't afraid to participate and play for fun. He's a great friend. He's created these fabulous bonds with four or five boys, and they're all awesome kids. One BFF he's known since he was born and is more a cousin than a friend. That one we're sure will be our son's close friend for life. Seriously, they're future Best Man kind of friends. He's curious. His favorite shows are "Mythbusters" and "How It's Made." He tinkers with everything and has to know how they were built or how they come apart This is definitely a trait he inherited from his father. He makes connections. I remember my high-school English teachers telling us that making connections between art, literature, music and the rest of the world, the rest of life, was an important skill, and I can see how that's true with my own kid. The other day we had an in-depth conversation about orphans in books and movies, and it was like a dream come true (I love talking about the plucky orphan archetype). He loves his siblings. Sure, he fights with them occasionally (especially his sister, who's three years younger than him and three years older than "The Baby"), but he's such a good big brother. Honestly, I'm sure my younger two will grow up singing his praises, because he's not the cruel, "Diary of a Wimpy Kid" type of big brother who delights in his younger siblings' misery. He's never decapitated his sister's dolls or dared his brother to paint his face green. Oldest brothers can be a dictatorial and mean, but not him. Pictured: The birthday boy with his baby brother and cousin. Today was the first day of school. The Schmoop (left, in his "awesome" Darth Vader backpack) started third grade, and my sassy girl the Schmoopette started kindergarten. It wasn't as emotional a morning as I expected, mostly because the Schmoopette didn't seem frightened, and because the Schmoop is an amazing older brother who helped her on the bus and told her exactly what to do. It was quite touching, actually, considering how combative those two can get with each other. As I waved goodbye, I said a silent prayer for them to be strong, independent, enthusiastic learners this year. I want my son to continue to fall in love with books -- even if it means it's all Hogwarts and Greek mythology and silly boy-comics all the time here -- and to strengthen his friendships and to have a crush on his beautiful teacher. I want him to run and play and not feel like he has to be the most aggressive kid in P.E. or recess, because it's just not him, nor should it have to be. He is a sweet and cheerful kid. He's excited and empathetic and kind and once said he wished he could grow up and become a doctor so he could make his Abuela better. He is just a delightful son, and I couldn't get by (literally) without his help. What a blessing of an oldest child. I want my daughter to learn to read, something she has struggled with but that I haven't pushed. I want her to stay confident and brassy (well, maybe not too brassy) and the social butterfly she's been since she was two. She will move mountains one day. She will make others fall to their knees in awe of her fiery spirit, her beauty and fierce intelligence. I got emotional after they left, but not because I was worried about them. I cried, because I missed my mother. Unlike my sweet but a bit out-of-touch in-laws, she would not have needed to be called and TOLD it was their first day of school. Mami would've known. She would've been the one to buy the Schmoop his backpack or the Schmoopette her special first-day-of-school outfit. She would've been on the phone with me by 10AM to find out how their send-off went, and to make jokes about the kind of trouble the Schmoopette is going to cause me in the possibly very near future. I think maybe it's time for me to attend a grief support group again if my grief is hijacking what's supposed to be a post about my children starting school. It's just that every milestone of theirs is also a reminder of a milestone Mami has missed. So when my husband arrived home and suggested we call his parents and fill them in on the kids' first day, I wasn't that interested. I didn't stop him, of course, but I got up and left the room. My kids are lucky to have grandparents on one side, but I selfishly can't stand that it's not my parents who the kids were calling. This post was inspired by my volunteer participation in the Yahoo! Motherboard. Our oldest son has a case of breakthrough chicken pox. I knew there was a small (10-15%) chance he could still get it despite the vaccination, but I didn't imagine he would contract it, much less during the penultimate week of first grade. Of course, knowing our family's history with odds and percentages (we're the couple that conceived three babies while using three different forms of birth control), perhaps I should have expected E to get chicken pox. On the bright side, post-vaccination cases are milder than regular cases. E doesn't have any pockmarks on his face and isn't scratching wildly the way I remember from my own case when I was 12. He's still fairly miserable, but he's not nearly as hysterical his mama was as a tween. I got mine nearly exactly 20 years ago, the summer after 7th grade, and was doomed to spend 10 days stuck in my house -- a real prison sentence for any Florida kid who'd rather be pool-party-hopping. I allowed E to konk out in my bed. We watched Shrek The Third together and then he drifted off into a four-hour, Benadryl-induced deep sleep. Watching him sleep (yes, that's him in the picture but he was only four then), I remembered that Mami let me stay in her room too, mostly because I had to stay away from my beloved grandmother, who was dying of pancreatic that summer in her own room across the house. It was pretty traumatic for me. I'm thankful that E's chicken pox doesn't seem nearly as upsetting as mine was, and even though he's missing all but the last two days of first grade, I am determined to make the best of our in-home seclusion. I just PRAY that baby J is spared, because THAT would be traumatic. Wish us luck, friends. But don't stop by unless you're willing to be exposed to the pox. The Schmoop turned six on Superbowl Sunday, which was fitting because a) he was born on Superbowl Sunday 2002, and b) the New York Giants won. He had a reptile and amphibian party at the Audubon Naturalist Society with about 14 kindergarten classmates and a couple of neighbors and friends. He and his pals not only got to touch Sam the black rat snake, they also went on a guided hike and saw several deer up close. It was a short but memorable party for our not-quite-so-little boy. This past year, E has become incredibly independent, which is a sigh of relief since he's about to become a big brother again. Since turning five, he's learned how to do his entire morning routine (except for making a hot breakfast) with little supervision. He no longer needs help in the bathroom (hooray!) as long as there are toddler wipes at the ready. He is unlocking text and reading short little chapter books. He is a whiz at operating the TV, DVD, XM radio, and any other electronic equipment in the house. He's also inherited his father's curiosity about how things work and are made. He knows when to come get me if his sister is in (or making) trouble. He adores his four older cousins and constantly asks when he can see them again. He is helpful in many, many ways and cries a whole lot less than he did just a year ago. He has grown at least five or six inches and is somehow one of the taller boys in his class (how this happened, we have no clue). He is showing us glimpses of the kind of gregarious, big-hearted older boy he's growing into all too quickly. I can still remember every moment of his unexpectedly early labor and birth -- from my water breaking to pushing his head out exactly seven hours later. His birthday is not just an annual commemoration of his life but the anniversary of when the husband and I became parents. He's our firstborn, the guinea pig in the life-long experiment of our parenting skills. We hope he'll forgive our many errors and remember how deeply we love him and delight in his contribution to our family's happiness. 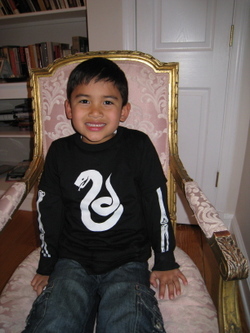 Many thanks to my good friend Bre for custom-stenciling E's birthday snake shirt! The Schmoop has lost his very first tooth (it's hard to tell, but it's the left bottom front tooth), and is in the process of losing his second. I had no idea that this could be happen at 5 1/2, and for some reason expected another year or so before we had to introduce the Tooth Fairy to our son. Can my firstborn really be getting "grown up teeth" already? I'm not sure I'm ready for this. Permanent teeth mean the potential for orthodontia. 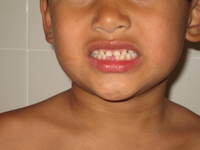 Orthodontia signals preadolescence, and preadolescence means puberty is just around the corner. Stop! I'm not ready for this. I need a few more years of baby teeth and baby interests. But the Schmoop's body has its own agenda. He's no longer the pipsqueak he was in preschool and, to my surprise, is one of the taller kids in his kindergarten. His voice is alarmingly low for a five-year-old (and indeed has been raspy for a couple of years). He checks out nonfiction books about wildfires, the solar system, paleontology, and natural disasters each week. He helps me parent his sister -- when he's not terrorizing her with his "big brother" proclamations. He's in every way except one (his need to pop into our bed in the middle of the night) a big, big boy. E will be six and a couple of months when the new baby arrives, and I have no doubt that he will revel in his role as big brother of not one, but two younger sibs. I don't worry about how a newborn will change him, because he's already a bonafide "eldest." I only wish I could be so confident about the Schmoopette. She's the one I'm nervous will regress and resent number three. But the Schmoop is, well, a trooper and a help. I just wish I could somehow slow down his development just a tad, pause a few frames here and there. For now, that means making a big deal about each lost tooth.